We’ve been here at Pole almost two weeks, and I’ve not yet showed you our telescope, or told you what it is that we’re doing here. the cosmic microwave background for the past 5 years. The primary mirror is 10 meters, or about 30 feet, in diameter. Light coming from the sky bounces off that mirror and is focused down through a window into the receiver cabin. That’s where the rest of our optics and our camera sit. The receiver cabin is heated, so we can work on all that equipment… but it’s hard to work on it when it’s pointed up in the air. So, we built the control room with a sliding roof and the receiver cabin with doors on its bottom, and we can point the telescope to dock the receiver cabin floor with the control room roof, open all the doors and easily work on things without going outside. Here’s a picture of the telescope docked. The green “boot” seals the cabin to the control room. 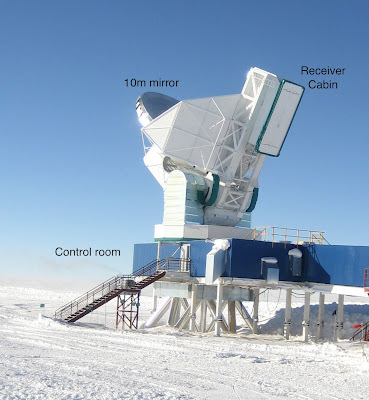 When we first arrived here, we stopped observing and pretty much immediately docked the telescope so we could bring the secondary optics and camera down from the cabin into the control room to work on them. We’re installing a new camera this year, and our job is to change some of the optics for that camera. We also put in some new anchors up on top of the cabin to accommodate a new baffle that will be installed later in the season. Here we are working up on top of the telescope, when it was -40F outside, windchill of about -70F. 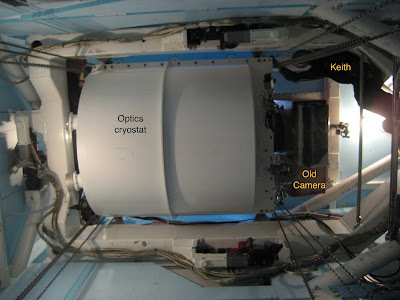 The circular thing in that picture is the vacuum window of the optics cryostat (which keeps the secondary optics very cold, 10 degrees Kelvin, more on that below), which was still mounted up in the cabin at the time. Moving inside, here’s a picture taken inside the control room, looking straight up (about 20 feet) at the optics cryostat and the old camera, just as we were about to lower it into the control room. It took a couple hours, but we got it down from the cabin, into the control room below. Here it is sitting on its cart, ready for us to start working on it. The big silvery thing is an assembly that includes the 1 meter diameter secondary mirror and some heat shields and black baffles that keep us from getting bad images due to stray light bouncing around inside the cryostat. The heat shields help us cool the secondary mirror and black baffles to 10 degrees Kelvin, just a little above absolute zero. We took the assembly apart – here’s me with the secondary mirror, and the baffles and heat shields behind me. Notice that even though I’m inside I’m wearing a warm fleece jacket and insulated overalls – the control room gets pretty cold when it’s windy outside. We put a new set of baffles and heat shields, which we brought down with us, on the secondary mirror and reassembled everything. Here is the new assembly – you can see the old one in the background. 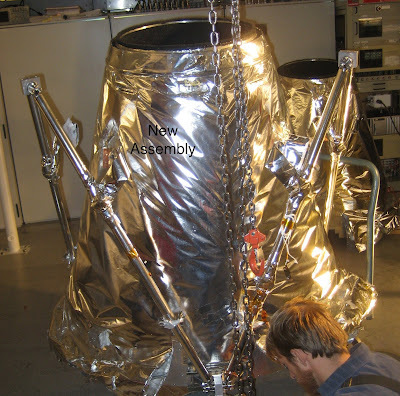 The alignment of the heat shields with the cryostat, in particular the opening where light goes into the camera, is very critical and tough to make work correctly. Here is a picture of the setup as we are just about to test-fit the new ones into the optics cryosat. We had to put in and take out the whole assembly (to readjust it) 3 times before we were happy with the alignment. We put it in for the final time the day before yesterday, and right now we’re doing the final “buttoning up” of everything, checking all the wiring, installing optical filters, etc, before we close up the optics cryostat hopefully for the final time. 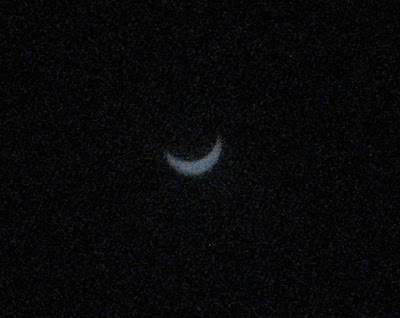 And, to reward you for reading this far, here is a poor picture, taken with my small “point and click” canon camera through two layers of aluminized mylar (like the shiny silvery stuff helium balloons are made out of) of the solar eclipse (moon passing in front of the sun) we had here two days ago. In this picture the sky appears black – that’s just because I had to use the aluminized mylar to reduce the glare from the sun enough to get a good exposure. In reality, the sky was still very blue, and in fact the brightness level only dipped a little, it seemed… enough that you could comfortably look around without sunglasses, but still a very bright day. Those ice crystals make for some interesting atmospheric phenomena. This is a picture of me with the sun behind my back, and two rainbow “sun dogs” on either side of me. You can also see a faint circle of bright 23deg from the sun that goes all the way around. Not seen here is an inverted rainbow above the sun, about 60deg or so from the horizon, and a bright spot on the horizon just below the sun. It was blowing pretty hard when we walked out to the telescope after lunch – but somone nice picked us up on a snowmobile – I rode behind on a sled. Normally riding like this is pretty chilly compared with walking, but given the good winds, it didn’t make much difference and it sure is faster! 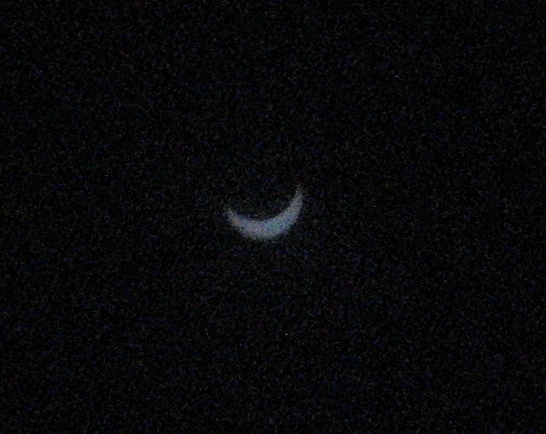 I’m posting this from the telescope – just about to head back for dinner. Unfortunately, I’ll probably have to walk. We live in a very nice new station that in many ways is like a cruise ship. Here’s an outside view of the station. It’s up on stilts to reduce the amount of drifting each year. Drifting is a big deal over the winter, when they don’t run big machines outside to dig out the snow – it’s just too cold. 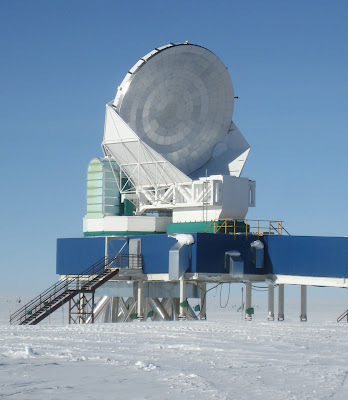 Here’s what they do in the summer to take care of the drifting that happened over the winter out in the “Dark Sector”, where all the telescopes are. All the buildings in the Dark Sector are also on stilts, but over the 10 or more years they’ve been there the drifting has brought the snow level of the whole area up so that the stilts are no longer visible. from the main station. We walk out there and back about 3 times a day – out in the morning, back for lunch, out again for the afternoon, back for dinner, and often out again (and back) for an evening session of work. Here’s a picture of the road to the DSL… with some lucky folks with a snowmobile in the foreground, and a tractor (which you can find by following its smoke/steam plume back to it, in the middle right of the photo) on its way out there to push snow. SPT is the big telescope out there. The walk crosses just beyond the end of the runway, so when a plane is coming in we aren’t allowed to cross over to the Dark Sector. Here’s a plane sitting in the “pit”, off-loading fuel for the stations use. The station is heated, and all its electricity produced, using fuel brought in on C130′s and – in the last couple years – via a land traverse “train” of tractors pulling fuel bladders on plastic sleds. There’s one headed our way now… I’m not sure when it will arrive, but that would be a neat thing to see! The food is pretty good, though high calorie and high on red meat. The thing I miss most so far: soy milk. I live in a pretty nice room. It has a bed that is raised high off the floor so I can store stuff underneath it, and a desk where I’m typing this now, and a couple dressers and a closet for clothes storage. It’s probably about 8feet by 10 feet… I think it’s one of the bigger rooms here. It’s certainly nice, though it’s a little chilly – it was 60F, but I turned the heat all the way up and now it’s 64F. and here’s a view of the front of the plane from the back end; the cockpit is up the stairs just through the opening on the left at the very front. The C-130 is very very loud, so we had to wear earplugs the whole way. That made it very hard to talk to anyone, so most of our time was spent napping or reading. It’s a 3 hour flight, and we did get to stand up to look out the small windows and see the transantarctic mountains. and into the station… but that’s another post! Sunday is a day of rest – or at least no flights – here on the ice. We spent much of the day working (after all, we have our computers and internet access), but we learned of an opportunity too good to pass up, and so went on a little adventure. The recreation folks in town installed an “Observation Tube” in the sea ice just outside town, and today it was open for all visitors. So, we took the short walk down the dirt road to the ice edge and then out onto the ice. By the way, the view wasn’t bad at all. That’s hut point in the foreground, and the tan/brown building in front of it is Robert Scott’s hut from the early 1900′s. The mountains in the background are the Royal Society range, topping out at about 13,200 feet above sea level. Gorgeous. After a short walk to a pair of small huts, we found the “Obs tube”, a metal pipe just shoulder width in diameter with a ladder built into it, going down about 20 feet or so into the ice and water below it. to the bottom where windows lets us look out into a dark but greenish world, lit by the sun filtering through the many feet of ice above. The light was dim, so my photos can’t do it justice… there were a lot of small fish and other creatures floating nearby, which you could see clearly but which come out slow because they moved during the exposure. Here is a picture of something stationary, though… an ice crystal growing on the outside of the viewing port. He’s the one in the back – I’m the one in the red coat. There are no regular commercial airline flights to Antarctica, so our next leg was on an Air Force C-17, which is a big cargo jet that can fly the 2000 mile journey in just 5 hours. 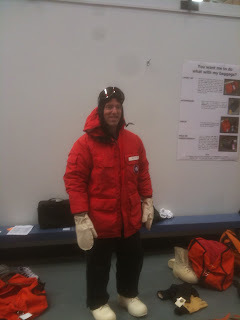 We woke up early this morning to head to the CDC, to gather our cold weather gear and get dressed for the flight. After checking in, grabbing a quick breakfast, and taking a quick bus ride to the plane we grabbed our bag lunches and boarded. Some people sat in regular airline seats strapped to “pallets” in the middle of the plane, some (including me) sat on web bench seats on the sides, and the back of the plane was filled with cargo – supplies for the station, perhaps including food, hardware needed for repairs, science equipment… and our bags! Here’s me in my seat… If you look closely you can see I’m wearing earplugs, which we all have to wear for the whole flight because it’s so noisy! I got to go up to the cockpit to look around – here it is with the pilot and co-pilot hard at work, and the guy in back on the left reading a newspaper. They fly the 5 hour leg down to McMurdo, then after a couple hours there for cargo offload/etc, turn around and fly back to Christchurch the same day – a very long day for them. They fly about three such roundtrips a week, with each crew and plane spending about a month down here before being relieved by a new crew and plane. That’s a lot of trips, and a lot of people and cargo shuttled back and forth! for the short ride into town. Now it’s Saturday evening… our flight to Pole is Monday, so we have tomorrow to explore McMurdo. Today was our day to go to the US Antarctic Center (or “Centre” as they spell it here in New Zealand) and get our ECW gear. “ECW” stands for “Extreme Cold Weather”, the kind of not-so-balmy stuff we’ll enjoy at the Pole. We arrived at the CDC (“Clothing Distribution Centre”) at 9am, to a sea of orange bags, two for each of us, and Mike McIlroy, the guy who runs the CDC. These bags were filled with all sorts of warm weather goodies which we tried on for size Here I am with my Big Red Parka, black insulated bibs, leather gloves, goggles, warm hat, and white “bunny boots”. All ready to go! Unfortunately, we didn’t get to board the plane and take off. I wish we did. But, they like to have the planes take off early in the morning, so they make us get our ECW gear one day, then report back for the flight the next day… we will report at 6:30am tomorrow, hoping to take off at 9am in our glorious C17. But before we leave the CDC, let’s meet some of the guys who make things happen here – Guy (in black) and Gary (in orange). They’ve been here… forever, I think. Just like Mike. They fill up our bags with gear, and then help us change for new sizes if anything doesn’t fit. and at least one more big warehouse nearby where they have more gear stored. (By the way, that’s JT on the left side of that warehouse photo). All outfitted, ready to go… now we wait until tomorrow. We’ve arrived in Christchurch, New Zealand! I had forgotten how long the trip is – about 33 hours in all. We got to the airport around 2pm on Tuesday, Nov 8th. We have some big baggage, because we’re bringing some of our science equipment with us that wasn’t ready to ship in time to make it to the Pole when we get there. The airline and TSA baggage screening folks at the airport were not happy with us because they didn’t like our big cases. They were heavier and larger than they’re used to dealing with – but we didn’t have to pay extra because the US Antarctic program arranged for that. One of them didn’t fit through the bag screener, and the TSA folks had to check it by hand, which made their day. Luckily they didn’t try to disassemble any of our delicate parts in there… I was very relieved once they closed it up and sent it on its way. After flying from Cleveland to Chicago (1 hour flight, 2 hour layover), then Chicago to Los Angeles (4.5 hour flight, 2 hour layover), we finally boarded the plane for the looooonnnnng (13 hour) flight to Auckland, New Zealand. Here’s the requisite “waiting in the airport” picture, in Los Angeles. I’m on the left, and JT Sayre (a graduate student at Case) is on the right. At this point it’s about 11pm Los Angeles time, or 2am Cleveland time. So we’re only somewhat tired by now. 13 hours is a long plane ride. Dinner, movie, sleep, movie, read, doze, breakfast, movie, read, arrive. Loved those movies – the international flights these days have the player in the seat in front of you, and you get to pick what movies you watch, when. We arrived at the International terminal in Auckland, and then had to pick up all our bags, go through customs, and walk everything over to the domestic terminal, a 15 minute walk away. 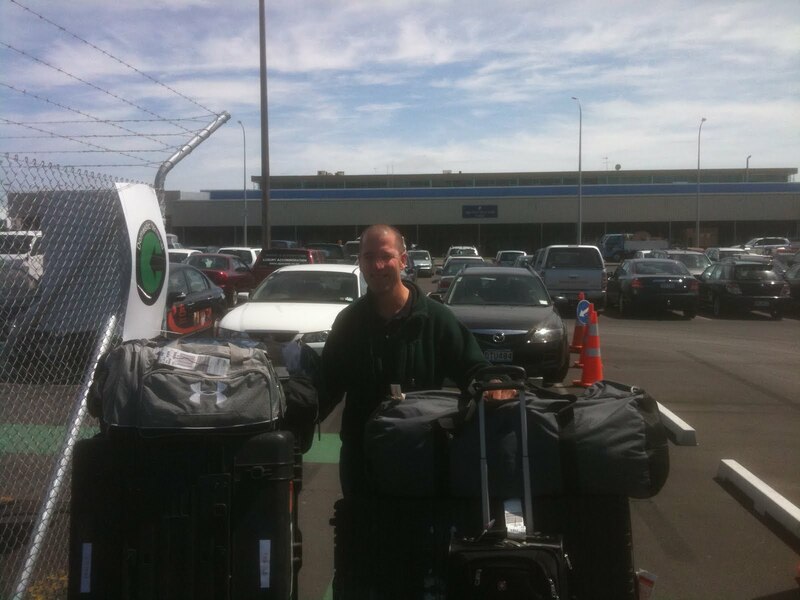 Here I am with my luggage cart (JT took the picture, so his is on the left)… it’s a big hard to see but each of us has a huge black 70lb equipment case, in addition to our regular luggage. I also have a smaller 40lb piece of luggage that just has nuts, bolts, tools/etc in it. Very dense! Once we’d checked in again, we waited another hour for our flight south to Christchurch, where we were greeted by two Kiwis (ie, people from New Zealand) with the US Antarctic Program. They got us oriented, and loaded onto the supershuttles that took us to our hotels. 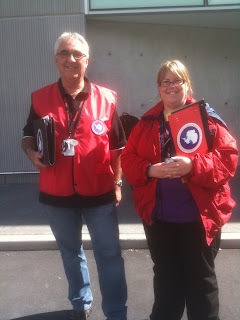 Here’s the two USAP Kiwi’s who met us – Leighton on the left, Kat on the right. And finally, here’s the super shuttle – they pull trailers behind them that carry the bags – that’s JT back by the trailer. It’s a good system, because we have a lot of bags! All told it was about 33 hours of travel from my house to the hotel here in Christchurch. A shower and a quick dinner later, time for sleep. 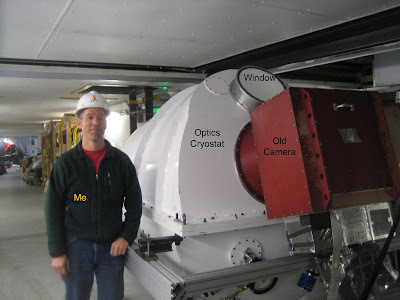 I’m heading down to the South Pole again this year… this time to modify the optics in preparation for a new camera that we will install in December. I’m leaving next Tuesday, hoping to get to Pole on Monday 11/14. Today I went to my son Henry’s first grade class and talked to them about my upcoming trip, and Antarctica in general. They were full of fun questions, comments, and ideas, ranging from the cold and the animal life to how we get food. Very fun! 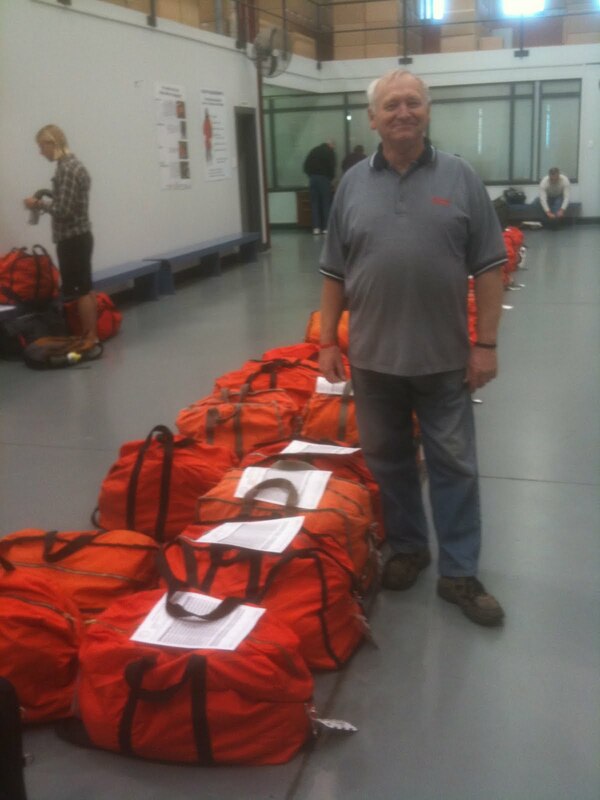 Back to packing – we’re taking a lot of scientific equipment with us, and have to make sure we don’t forget anything!